Salmaan Khan: This is the first time in 30 years that a single party has won a clear majority. It is also the first time since India’s independence in 1947 that the Indian National Congress (INC) will not be in a dominating position. 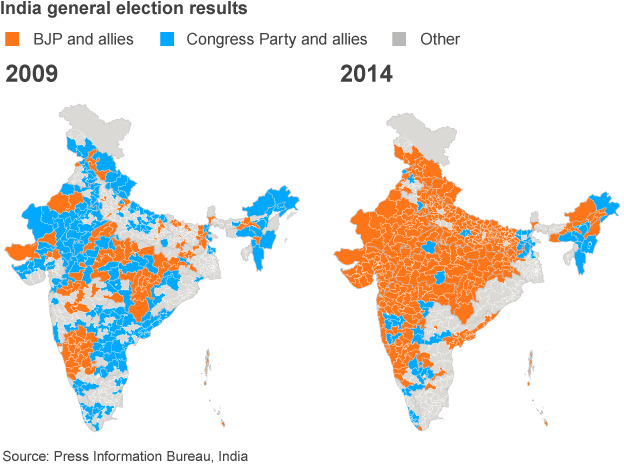 What did India look like going into these elections? And is this simply an “event” or a more permanent turn in Indian politics? Himani Bannerji: There are a lot of things here to start with. One thing to remember is that the BJP did in fact come to power before, though not with an absolute majority. In the late 1990s, the then Prime Minister Atal Bihari Vajpayee was a BJP member. So this is the second time. The BJP had actually made several attempts to come to power before. They kept trying, but finally they won during the elections around 1998. Though they needed coalition partners who largely resembled them in ideology and economic policies. Do I think it’s a turn in Indian politics? I think it expresses a turn that has been developing since the last few decades along with the weakening of the Congress Party, which has become largely ineffectual, and its splintering into different groups that are actually breakaways of the old Indian National Congress. As well, there has been a gradual decline of the left, which although never overwhelmingly present in Indian politics, was strong enough to form alternate governments in places like Kerala since 1957, and in West Bengal from 1977 to 2011 as a “left front” whose main component was the Community Party of India (Marxist) (CPI[M]). Tripura is the only one of these states for the last few decades that still has a Communist government. It’s a very small province and the CPI(M) has done very active development work among the different factions of Bengali’s and tribal peoples. Their ability to create a better playing field for different parties has reduced some of the tension in that province, and neither the BJP nor the Congress made any kind of headway there. So yes, it does signify a turn. 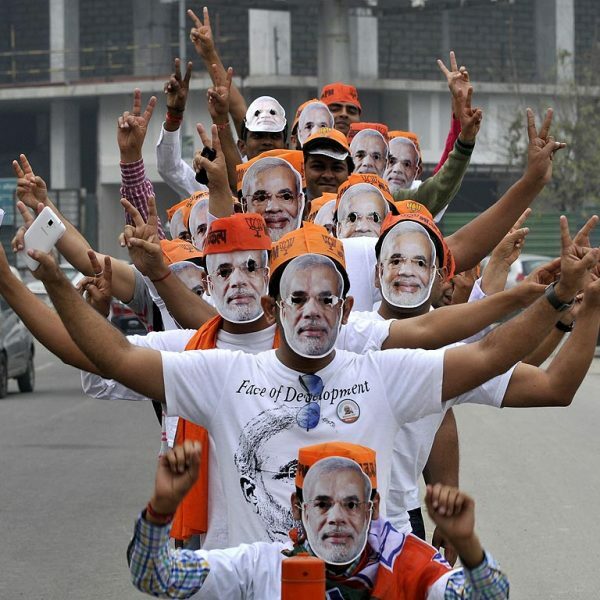 The other thing to remember is that in many Indian provinces, such as Uttar Pradesh (UP) – which is the most populous state with the largest number of seats in Parliament, caste politics was strong. Two caste parties in UP were strong, one the Samajwadi Party, which means “socialist party,” and the other Bahujan Samajwadi Party, “great socialist party.” The latter particularly addressed the lower castes. Its leader is a Dalit woman, and it was based on Dalit politics. But none of these were left parties. They had the general ambition of creating small capitalists, entrepreneurs among lower castes, including the Scheduled Castes and Scheduled Tribes, aiming towards some kind of social and economic entitlement. But, by no long stretch of imagination were they left wing in the sense of class politics or anti-capitalism. The emergence and development of these parties fractured the Indian political terrain, taking a lot of voters and breaking up the earlier political space dominated by a few large parties. Though with this election, they too disappeared. So, as we see it, we have a receding Congress Party, an almost defunct communist left and defunct caste parties, thus leaving a space empty for the current BJP victory. SK: Given the dominating role that the Indian National Congress has played on the Indian political landscape since Independence, can you talk more about it’s the role as a party and the platform it sought to bring to Indian politics? HB: The Indian National Congress is a very old party which started out in 1885 and took on the major agency of political struggle for nationalist, anti-colonial independence. Though something to understand is that it has never had one single political platform with a single ideology and class base. It has always had a very complicated platform with at least three or four political voices and some very important political figures and social and political thinkers in it. So there hasn’t been one discernible strand. And this is actually why the INC succeeded for so long; because it could have appeal on different grounds to different kinds of people, ranging from big capital to farmers. Supporting capitalist development in India, it also had elements of socialist thinking, particularly in the strand that is called Nehruvian Congress. Jawaharlal Nehru’s thinking was influenced by socialism and in particular Fabian socialism. So, he didn’t see a fundamental contradiction between capital and labor, but had a kind of Fabian view of distributive capitalism and social involvement of the state. Nehru was well read in British socialist literature and a strongly secular thinker. He wrote two books that would be good to read about regarding the kind of politics he preferred – the kind of India he imagined. They are The Discovery of India and Letters from a Father to his Daughter, which were his prison letters to his daughter, Indira Gandhi. Nehru was not alone in the party and represented a tendency in the INC which desired a liberal social fairness, was anti-caste and held progressive views about women. He was keen on industrial development in India and industrialization of agriculture in particular. This made possible the “Green Revolution” that helped make India more self-sufficient in terms of agricultural production. But the Congress also had a passionate populist – not socialist – approach represented by Mahatma Karamchand Gandhi. Gandhi developed his anti-colonial politics during his stay in South Africa where he remained until 1915. He was in his mid-forties when he came back to India and got involved in politics there. He had already helped develop the African National Congress and naturally joined the ranks of the INC. His was a foundationally populist politics that was awake to the issues of racialization and of race in nationalist struggle. And whereas Nehru represented the secular strand of cultural tolerance, modernization and development, Gandhi’s populism was rooted in the hindu and rural imagination of society. He relied on traditional material, particularly from religious epics like the Ramayana. Religion and religious consciousness were central to his project. His concept of justice laced the common law with ideas from the Ramayana through the image of the just king Rama and imagined the future kingdom of India as Rama Rajya – the rule of Rama. Gandhi also had a paternalistic and benevolent approach towards the peasants and believed that, while the rich must protect the poor, the poor must not revolt or display signs of class struggle. Gandhi, being a lawyer by training, was also aware of how businesses are run, properties made and secured, and he also approved of capitalism and had a positive relationship with facilitating business houses. In fact, predominant industrialist families in India, particularly the Birlas, contributed massively to the Congress’s funds. As a return, after independence, they were granted leases on certain areas of industry and development through the very offices of Gandhi and Nehru. So, the INC had, through Gandhi, two voices: one meant for the rural and ordinary population believing in religion and tradition, and another for the Indian (hindu) businessmen and the middle classes in whom he tried to imbue a kind of a “moral” consciousness and seek a “moral independence.” He named his political method “satyagraha,” which means quest for truth. His autobiography is called My Quest for Truth, and he programmatized this politics with non-violence involving civil disobedience, boycott of British goods, works stoppage and so on. Gandhi and Nehru aside, there was a third voice in the Congress. This was alive and well from the late 19th century on and developed out of hindu proto-nationalisms. In this version the country was conceived as a mother goddess and the people who would bring independence as devotees and her children. This hindu approach was non-secular and had a negative relationship to the muslims. It displaced onto the muslim period of medieval north India a kind of anger that would have been better served by being used against the British. Some of the key figures involved in this hindu nationalist approach were members of the INC. So, we see how the INC was never explicitly secular or religious, it simply never had one voice. It had all of these different voices, pro-capitalist, pro-people, pro-hindu, pro-secular, pro-westernization and development, and pro-tradition, with an ambivalence or suspicion towards muslims. But the Nehruvian aspect of the INC won out through the ’30s and ’40s as Gandhi came to support Nehru. He was after all a western educated lawyer, not the popular saint that he is thought to be, and wrote very trenchant letters on diplomacy and statesmanship to the British Governor Generals and so on. Politically speaking, Gandhi was a ventriloquist, and once in a while he would give a call for popular uprising and it made India “ungovernable.” Love of tradition and religion notwithstanding, Gandhi’s modernist tendencies, his understanding of the importance of a modern state and belief in liberal values made his affiliation with Nehruvian secularism comfortable. And so, Nehru became the dominant spokesman for the INC by the early 1940s. This was very effective as the Congress had a huge machinery of public mobilization, the like of which no country in the world has ever had except China. As well, when India became independent it needed to quickly industrialize and the Nehruvian approach continued to triumph. With independence also came the Indian constitution written by Dr. B.R. Ambedkar, a Dalit leader, who wrote a most enlightened constitution. Though there were elements of socialism, it was liberal democratic with no room for communism. The constitution was secular, with no caste, creed or gender bars in citizenship. It also gave a distributive role to the state and the right of people to work, to dignity, to food, and so on. But class and capital did not form a factor in it. SK: What about legislation around property rights or land distribution? HB: It did challenge property to the extent that there was a huge inequality in landed property in India. For example, in the 1950s Nehru and his cabinet produced the anti-landlord Act whereby you couldn’t own beyond a certain amount of land, but this was more honored in the breach than ever enforced. Farming rather than landlordism was meant to be the goal. Though not all parts of India had landordism (zamaindari), the disparity in landed property was huge and land or rural labour abounded. Wherever there was an excessive concentration of land possession this law was supposed to be used, and was used to some limited extent. But the real use of this land ceiling law happened under the communists after 1977 in West Bengal where, taking this bourgeois law, they tried to implement it to the very letter. Thereby masses of land become released from the hands of illegitimate owners and were distributed among the land poor. So, land distribution happened in its concrete sense in just two places – Kerala and West Bengal. You have then in India an interesting state formation which was dedicated to some amount of Keynesian protectiveness towards the deprived, seeking a planned and mixed economy. The state played roles in industrialization as well as in introducing capitalism and industry into agriculture. India’s nonalignment left a lot of space for the Indian industrialists to develop. The aim was to develop an import substitution policy and practice. For example, cars were not imported into India. India produced its cars, its trains and its airplanes instead of buying them from the West. The Indian state’s planning commission took its duties quite seriously and adjusted its priorities in five-year plans. It moved steadily towards capitalist modernization and tried to protect the poor from the ravages of all this if possible. When the idea of the “Green Revolution” became popular there were large increases in production in places like Punjab as the use of machinery, specialized seeds, chemical fertilizers, etc. slowly began to rise. But in most of India rural poverty was still pervasive. And so, through this favour to Indian capitalism, foreign capital was effectively blocked out, leading to a lot of complaints from the West. At this time there was also a large growth of the left, particularly the Communist Party of India – Marxist, which after its split from the Communist Party of India (CPI), gained prominence. Many peasant organizations emerged and trade unions became important too. India at this time was largely outside of the circle of the USA’s client states. SK: It seems like there was a strong Indian National Congress-dominated state that was trying to regulate the economy through a Nehruvian or Fabian Socialist approach. When do we begin to see the decline in the Nehruvian modernist and secularist project? HB: You begin to see seeds of it after the death of Nehru, or even before. There was always a constant pressure on India from Western governments and capitalists to take over the economic field, and inside the country there was a pressure to push the state towards stronger privatization. However, none of this worked very effectively until Nehru died. And even after that there isn’t a sustained break with secularism or it doesn’t just disappear as there was a murmur of the non-secular approach that was always there. A slow anti-secularism and a quest for a hindu identity became pronounced. What lay underneath layers of effective secular politics became prominent as a hindu national imaginary. The logic of elections often demanded the appeal to religion, so for example, of having muslim candidates from muslim areas. But this anti-secularism grew stronger with the drive toward a greater role for private capital. Though Indian secularism had meant for a long time accommodation of all religions, hindu supremacy began to win out as non-secular parties emerged. SK: You said there was a murmur of religious nationalism and anti-secularism that was always there. Can you speak more on this and how it has contributed to religious nationalism coming to the forefront in India today? HB: The hindu cultural nationalist element that lay underneath for a long time became increasingly stronger when the Rashtriya Swayamsevak Sangh (RSS), which means National Volunteers’ Association (established in 1925) took hold of the national polity. With a eugenics-believing doctor at its head, it was a splinter of a political party called the Hindu Mahasabha (Great Hindu Association). Some of its members were previously connected with the Indian National Congress. In 1925, the Mahasabha inspired the birth of the RSS with Dr. Golwalkar at its head and they developed as a cultural nationalist group, a civil society group really. They didn’t show interest in contesting in the elections or struggle against British rule. They wanted to forge a hindu Indian identity for the country. They were not so interested in worshipping gods and goddesses either. They sought to distill a kind of a casteist hindu -brahmanical essentialist identity, which they call “hindutva”. And their enemies were not the British, but the muslims who were also contesting for a state. They saw muslims as invaders of India, foreigners who led the downfall of Indian (hindu) culture. The RSS had no negative things to say about the British. Some of its prominent members, like Golwalkar and Savarkar, were even admirers of the Aryan theorization of the Nazis and the Aryanist nationalist politics which they sought to use for themselves. They also believed in eugenics for the purposes of creating of a pure hindu nation. They considered themselves Aryans as the German linguist Max Mueller identified Sanskrit as the stem of Aryan language. Now, these people did something very interesting in that they never formed a political party. They formed civil society cultural cells and branches across North India, the Hindi speaking area in particular, and established numerous cultural organizations. In doing this they focused on filling some social needs, such as giving afterschool health training and recreation to mainly boys, but also girls, and teaching children piety and filial obedience in relation to the elders and devotion to the hindu motherland. They militarized these children through physical and martial training and made them into paramilitary groups by teaching them sword and stick fighting and various other fighting techniques, largely because they believed that the hindus had become emasculated. The muslims had helped to do that. Now they needed to get their masculinity back and become hindu heroes. They also believed in strong brahmanical patriarchal families. They gave women roles of strong mothers and supportive wives, as preservers of the community, transmitters of tradition and as mothers of heroes. So, it was this kind of martial code with a hindu supremacist identity which they called hindutva or hinduness. The essence of this hinduness was being against muslims. So the RSS’s hinduness doesn’t demand that you compulsorily worship in temples, but rather a conduct of brahmanical austerity, revival of hindu scriptures and “traditional” culture, and a morality of the pure and the impure. And every once in a while there were riots inspired by them. And each time they got more hindus mobilized to its project. This is all pre-independence. There were massive pre-independence riots associated with the idea of claiming a separate land for muslims and the rise of the Muslim League, both of which the RSS and its “hindu” allies repudiated. The RSS became a powerful agent of colonial “divide and rule” policy. It was strongly anti-Ghandian. Gandhi’s populism and his unwillingness to be actively anti-Muslim and pro-partition made him unacceptable to the RSS. And one member of the RSS who rescinded his membership but remained inspired and attached to it, Nathuram Ghodse, assassinated Gandhi in 1948 shortly after Indian independence. With the killing of Gandhi, the RSS was temporarily banned and could not blossom into a big political organization or contest elections. So it continued in a low key fashion, going kind of undercover until they were unbanned in the late 1950s. 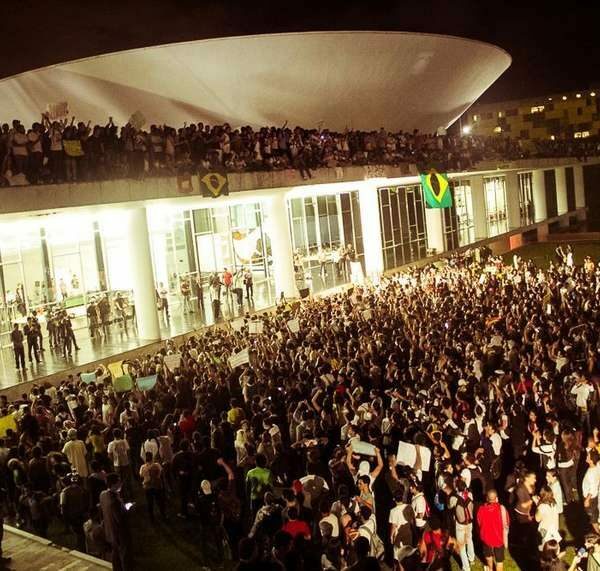 But even after that, they still did not contest in the elections and continued with their cultural civil society work. Following the lifting of the emergency in 1977, the RSS contested in the Indian elections through its wing, Janata Dal (People’s Party). There were many anti-muslim figures who were prominent in it and they were anti-Congress as well, mainly on account of the Congress’s secularism. This party over a period of time developed into the BJP, the Bharatiya Janata Party (Indian People’s Party). Throughout this time the Congress weakened, especially following the assassination of Indira Gandhi. In a way, she had been apprenticed in politics by Nehru, and retained some of Nehru’s third-worldism, an interest in south-south relations. She had a foreign policy in keeping with this. For example, she allowed the Palestinians to have an office in Delhi and did not have diplomatic relations with Israel. South Africa was another banned territory, and Portugal, because it still had colonies in Africa. Mrs. Gandhi was also close to Cuba and Castro. She maintained an adherence to secularism and her anti-Khalistan policy did not stem from hindu supremacy or a hatred of Sikhs. Now while all this was going on, through decades of Western capitalist expansion, mainly under the auspices of U.S. imperialism, the Indian economy was becoming less competitive. The capitalist class had accumulated but didn’t have much space for investment, and they resented the state’s involvement in the economy. Pressure from other countries also grew. The Indian planning commission with its policy of mixed economy became weaker, and the hungry industrialists were waiting to privatize. Following her death Mrs. Gandhi’s son, Rajiv Gandhi, came to power. He was a weak prime minister and susceptible to the privatization lobby. He introduced the first privatization initiatives in India. At this time the BJP, born of the RSS, had also developed into a political party and also had nothing against privatization and the state’s withdrawal from the economy. So from the early 1990s on neoliberalism became the guiding principle in India. More and more laws pertaining to nationalization were rescinded. Foreign debt accumulated, inequality increased, muslims were consistently seen as terrorists, the province of Jammu and Kashmir was the place where the Indian army showed its might and relations with Pakistan continued to further deteriorate. The economy and politics were in such disarray that one could draw together this fracturing neo-liberal nation through the mythology or ideology of religion. So, what the economy divided religion united. And as neoliberalism and religion can go hand in hand the national imaginary was ethnicized. The need for an enemy was urgent for the hindu bloc to develop. Hindutva or hinduness created a solid block of an RSS-imagined ideology of a hindu nation, and pitted it against muslims as another homogeneous solid block. In the unification of neo-liberal capital with hindu supremacy, fascism became an active political process in the country. So, we have a situation here where the growth of neoliberalism, the withdrawal of the state from every sector, the growth of poverty and hunger, and the appeal of religion as a way of drawing things together, culminated in December 1992 in the cry of returning India to hindus through the destruction of a 15th century mosque built by Babur, claiming it to be the birthplace of the epic man-god Rama. This followed a “chariot” journey of one of the BJP leaders, L.K. Advani, across north India gathering RSS/BJP cadres. This kind of violence went to its peak in 2002 in Gujarat, where there was a state orchestrated pogrom led by one Narendra Modi, the then chief minister, using the police apparatus to facilitate the attacks against muslims. At least two thousand muslims were killed, housing complexes and businesses were destroyed, women were raped, pregnant women attacked with swords. Unspeakable atrocities happened. This was a genocide. But, other smaller and different proportions of riots went on and the criminalization of muslims proceeded apace. And sometimes the RSS itself was carrying out certain attacks and attributing these explosions and bombings to “muslim terrorists.” Few were caught that did this. So finally, then, you can see that the election in 2014 brought all these developing tendencies and activities to its head and ethnicized the political soil completely, with very little exception. And the lure of wealth and success in certain sectors in India was overwhelming. The new middle classes who couldn’t wait for anything anymore and who thought that Modi would give them development took the election with them. It is impossible to really grasp what is going on in India without knowing the context of these developments. It’s a country of a 1.5 billion people with many millions in starvation, malnutrition and eviction, with neoliberalism rampant, and frequent explosions. Muslims are terrorized and other religious groups too, as are secularists. The situation can only be called fascist.